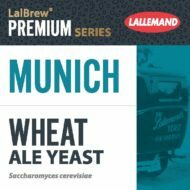 LalBrew® Munich yeast is a relatively neutral strain which can be used to produce a wide variety of wheat beer styles. Esters and phenol production is lower than for traditional hefeweizen strains such as LalBrew® Munich Classic. LalBrew® Munich provides a baseline profile of banana and spice aromas, but leaves space for the brewer to showcase other spice additions. Traditional styles brewed with this yeast include but are not limited to Belgian White, American Wheat, Berliner Weiss, Gose, Hefeweizen, Dunkelweis, and Weizenbock .